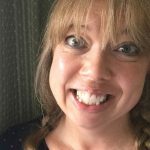 Hello lovely readers, do you think I’m crazy? 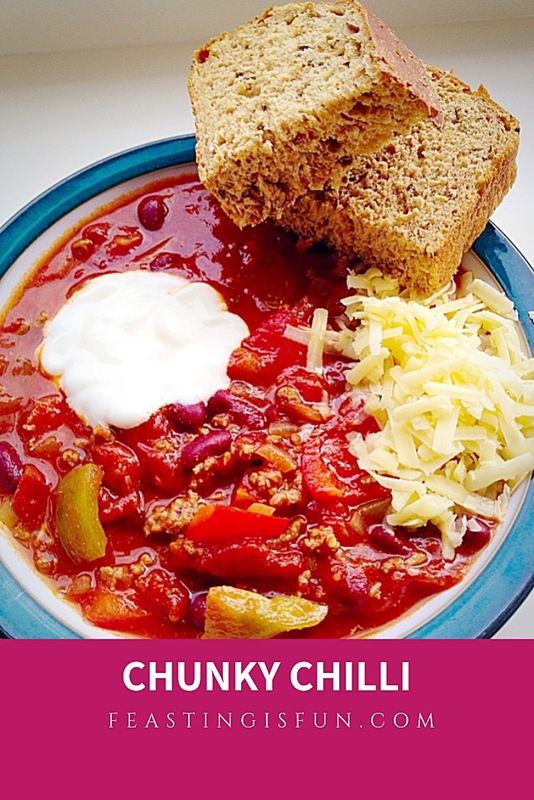 Because my Chunky Chilli is made in the midst of Summer! And I understand, I had a moment with myself before going ahead and making this anyway. Trust me it’s good, even on the most scorching of days. So here’s the thing – I try, on most days to get our evening meal made in the morning. Yet my body, frustratingly disruptive and painful that it is, does not, can not, start chopping and stirring at 5pm when dinner used to be made. Usually around 3 o’clock in the afternoon, very often well before that time, I’m done in and need to lay down. Consequently, any task that takes more than a couple of minutes standing just ain’t gonna happen! While I’m learning to adapt (see Adapting to a New Normal) I made this Chunky Chilli. Most importantly, it was bubbling away, on the hob, by 10am. And the malted loaf was baked and cooling by 11am. Result! I simply love cooking, yes there are more days than I’d like, where I can’t. Yet on the days I can, I do. Sometimes I double up on the recipe, so I can stash a meal in the freezer. 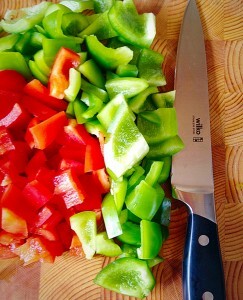 Although that comes with it’s own challenges; more time standing, chopping, slicing, stirring etc. So I do what I can and at the end of the day, whatever sort of day it’s been I look at what I’ve achieved. And it keeps me positive and (not literally) on my toes, constantly thinking of new ways of getting dinner on the table. Also, I am actively teaching all three of our children to cook. In fact, my heart swelled the other day, when I found a printed copy of my Crunchy Homemade Coleslaw recipe. 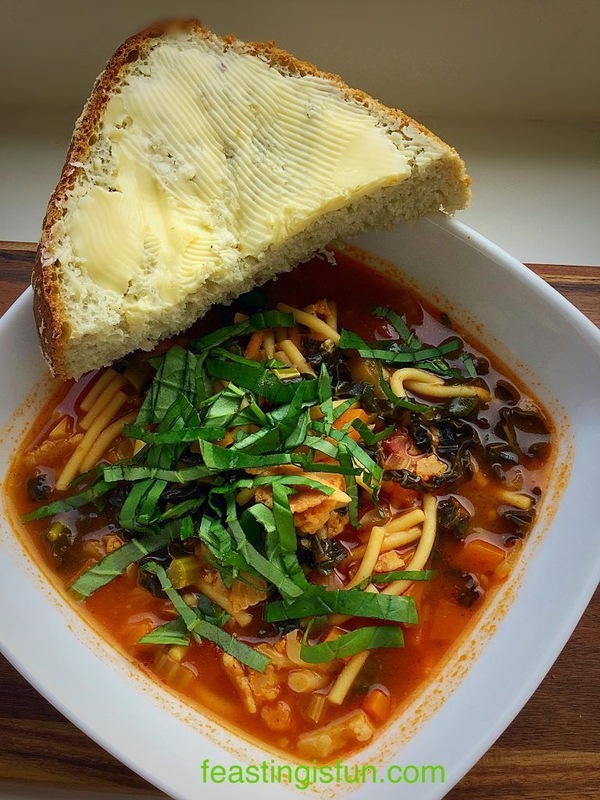 Our eldest daughter had made it to go with dinner and it was perfect! 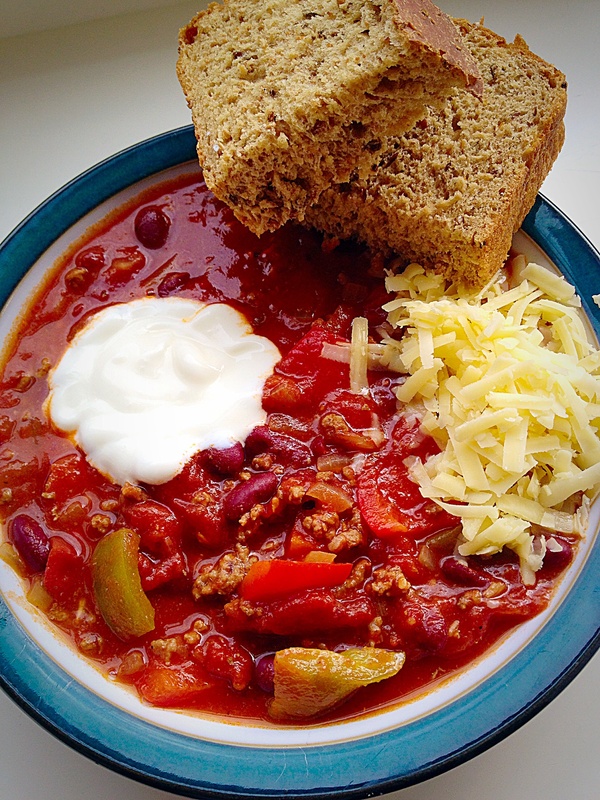 Chunky Chilli – a delicious make ahead meal. 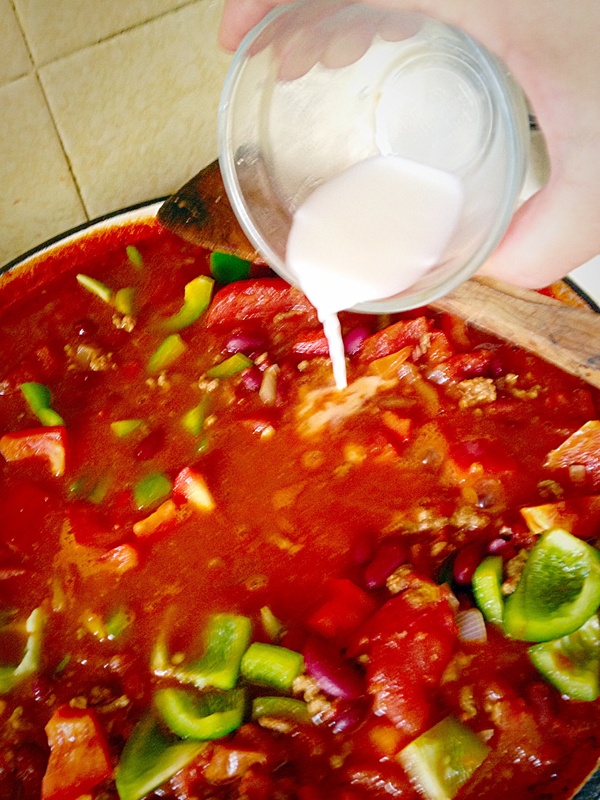 So, let me show you how I make Chunky Chilli! First of all add the oil to a large, heavy based pan, over a medium heat. 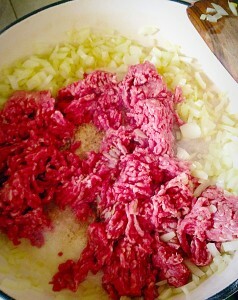 Next add the onion and cook until just soft and slightly translucent. 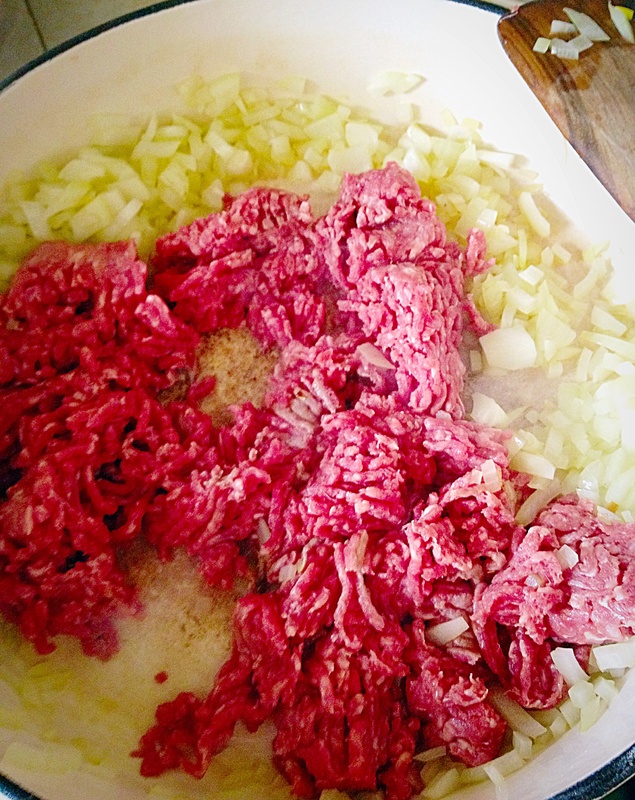 Tip the minced/ground beef into the pan and cook until browned. 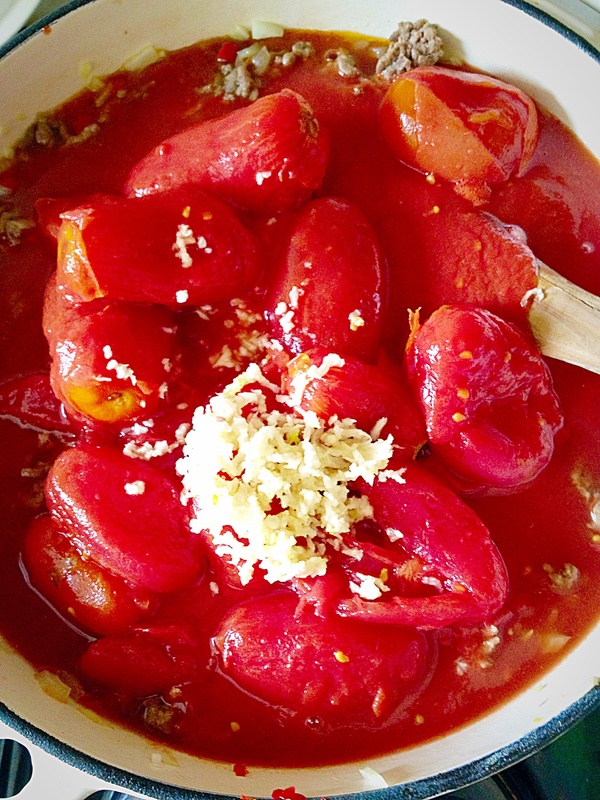 Add the finely diced chilli and tinned tomatoes. 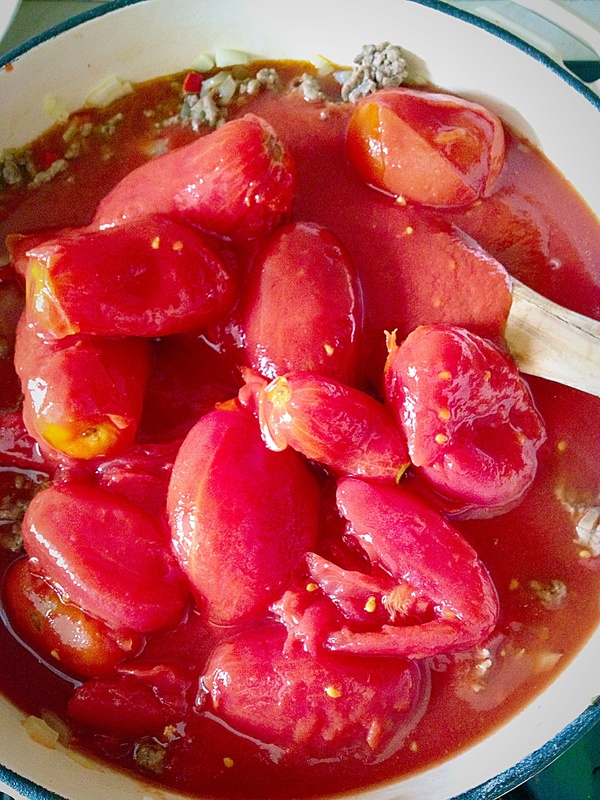 Rinse each tomato can out with a little water and add this to the pan. Now add the cumin and garlic. And use a wooden spoon or spatula to gently break up the plum tomatoes. During cooking they will break down further. 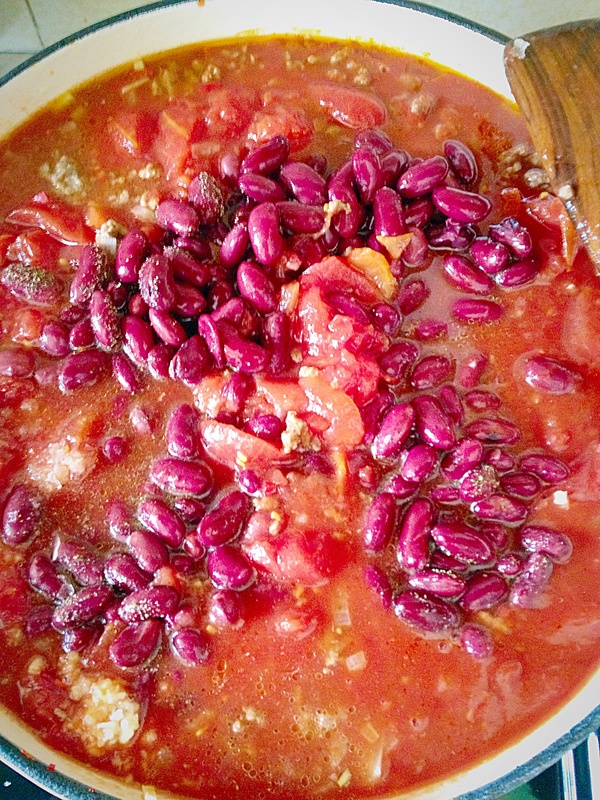 Empty the kidney beans into a big sieve and rinse under cold, running water. Add the rinsed kidney beans to the pan. Allow the chilli to bubble gently for 2 hours partially covered with a lid. 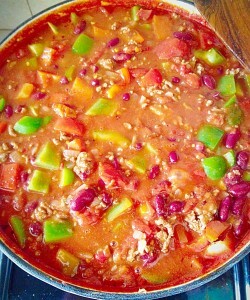 I prepared this Chunky Chilli in the morning. After 2 hours cooking the heat was turned off. Check the seasoning and adjust as necessary. 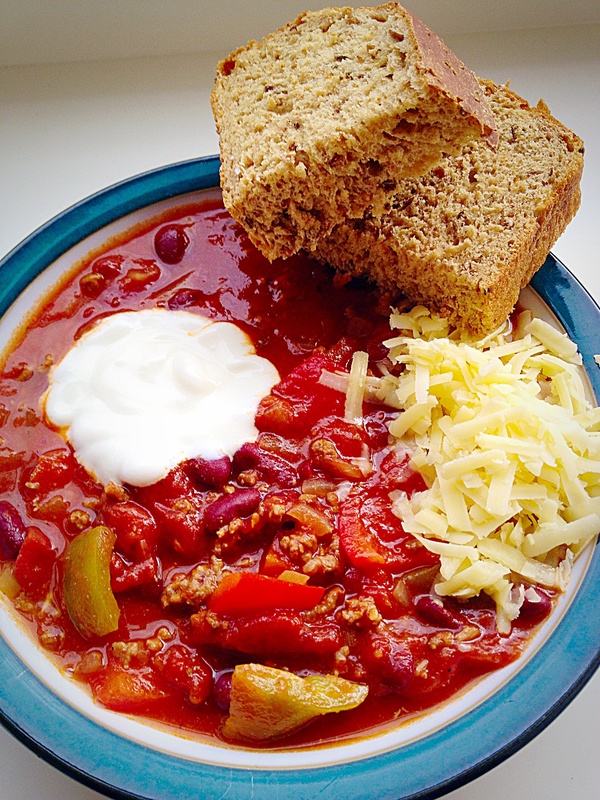 Chunky Chilli – so called because of the Chunky diced 2 green and 1 red peppers! Then add the diced bell peppers, the chilli will be reheated later. Alternatively if you make this chilli ready to eat, add the peppers during the last 10 minutes of cooking time. Ensuring the peppers retain their crunch. Dissolve the corn flour in a couple of tablespoons of cold water and add to the chilli. 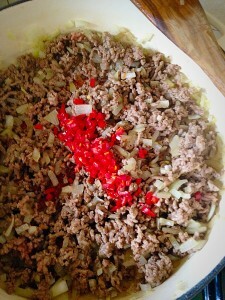 Give the chilli a good stir and allow the corn flour to thicken the sauce. Finally pop a lid on the pan and leave to cool until needed. 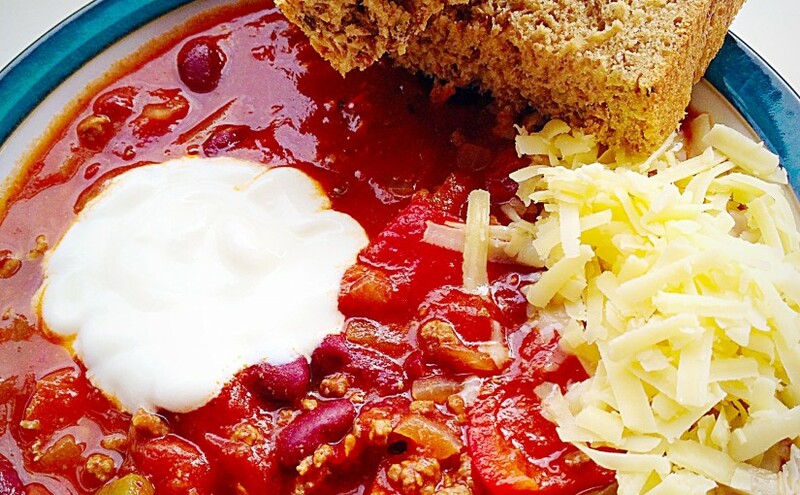 I like to serve this Chunky Chilli in a bowl with a generous dollop of plain yoghurt, tortilla chips or a thick slice of hearty, homemade bread and a little sprinkle of grated sharp cheddar. 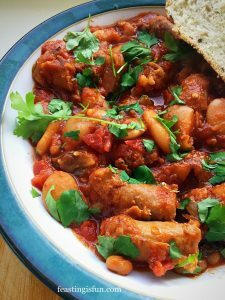 Making this hearty, warming and economical meal is an easy way to feed the family.. Likewise they can all be easily scaled up if you need to feed a crowd. Also adding some crusty bread, such as my Seeded Cob Loaf or Easy Homemade Cottage Loaf not only makes this meal go further, they are perfect for dunking in spicy juices! Resulting in a delicious feast for all to share. 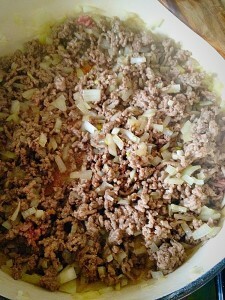 About halfway through the summer, I start craving meatloaf and chili 🙂 So your version sounds like an excellent option! Thank you Liz. I’m glad it’s not just me. 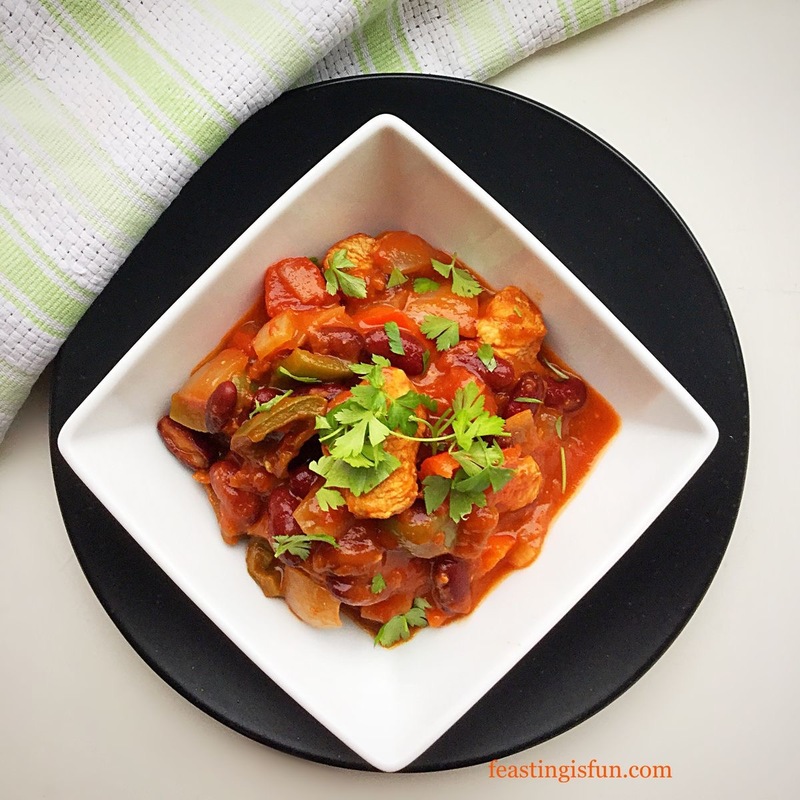 I love salad, but sometimes a bowl of something spicy just hits the spot!